A greater number of Russians are seeking spiritual solace by returning to their Orthodox roots. This is greatly visible in Trinity Lavra of St Sergius Monastery, which is in the town of Sergeyev Posad. Essentially a day trip from Moscow, the monastery is the most important monastery for followers of the Orthodox faith in Russia. St Sergius of Radonezh, a venerated Russian saint, founded the monastery in 1345, with the construction of a simple church. Ten years later, the saint brought about a monastic charter that called for the construction of the supporting buildings like living quarters and a kitchen. His followers used the charter as a model and this is visible in famous monasteries such as Solovetsky. St Sergius was believed to have provided mystic support to Prince Dmitry Donskoy in his victory over the Tatars in the battle of Kulikovo Pole in 1380. The victory is seen as the turning point when Mongol influence began to reduce in Russia and subsequently led to the formation of the modern Russian state. St Sergius died in 1392 and was later named the patron saint of Russia. Many of the churches in the complex also display art work by some of Russia’s most well known painters. Replica works of Andrei Rublev and Daniil Chyorny adorn the entrance walls. The great painters were summoned by Ivan the Terrible to decorate the main 15th century cathedral with frescoes. The monastery’s six-pillared Assumption Cathedral was commissioned by Ivan the Terrible in 1559 and construction finally finished 26 years later. Boris Godunov, a de-facto regent of Russia, made internationally famous by the opera based on Alexander Pushkin’s drama, is buried in the vault with his family. Another building that catches the eye is an 18th century bell tower, which at 88 metres was one of the tallest buildings in Russia at that time. Recently more than 30,000 pilgrims visited the monastery for special prayer services in honour of the 700th anniversary of the birth of St Sergius. There are often long queues to enter some of the main churches, but the complex itself is well spaced out and is a great place to witness the rising religious fervour in Russia. Sergeyev Posad grew around the monastery and is now a charming and easy going provincial town of around 114,000 residents. It is one of the towns on Russia’s famous Golden Ring of historic and cultural cities. Numerous Muscovites also have their dachas in the countryside near the town, making the drive there from the Russian capital, a bit of a nightmare on Saturday mornings in the summer. It is more advisable to visit the monastery on a weekday. 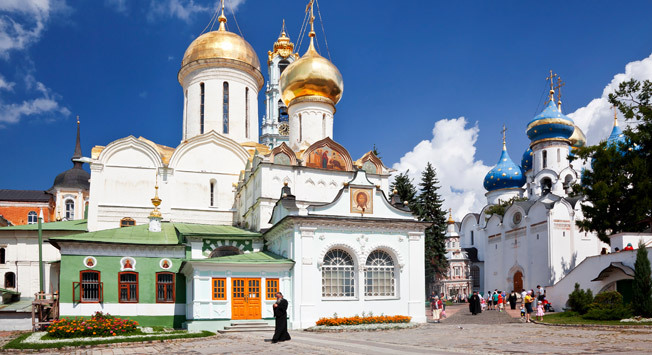 For many on a tour of the Golden Ring, the Trinity Lavra of St Sergius is the first stop. The monastery is open from 5 am to 9 pm in the summer. Make sure you buy some of the fresh baked bread from the monastery and try out the kvas, a beverage made from fermented rye bread. Women are expected to cover their heads, and men are not allowed to wear shorts. Photography inside the churches is also banned.